Verbena Hostata, commonly known as Blue Vervain, is one of my favorite wildflowers in Missouri. I love the blue color, which sometimes has a purple tint to it. The butterflies also like it, so that's a big winner for me! Many of the wildflowers that grow around my pond have herbal qualities. 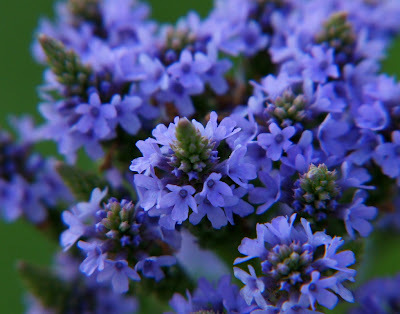 According to altnature.com, the Blue Vervain is also called Herb of Grace. It is edible and medicinal, and has many uses in Native American culture as food and medicine. One of the things on my life list is to have an herb garden and learn how to use those herbs. So, I really enjoy learning about the herbs Mother Nature has already provided me with without my even knowing! so beautiful. the color reminds me of dawn. Wow, the color of this beautiful flower is wonderful! Thanks Misty and have a great week. I can imagine how pretty a field of blue this must be! What a beautiful colour it is! Hi Misty...your blog caught my eye while visiting another! I saw the name of you post " Herb of Grace"...Grace is my name!! It is a lovely looking herb I might just look into that one!! I used to have a herb garden but it got to be to much to maintain, but I loved it! !